Angola , a Portuguese-speaking country, is strongly influenced by the cultural output of Brazil, the world’s Lusophone powerhouse. Brazil is often represented as a land of hope in Angola . Angolans can’t get enough of its telenovelas , the intrigue-filled television dramas that are broadcast daily on Angolan channels, or of the glamorous styles worn by soap opera stars. To satisfy women’s fashion demands, a growing number of female entrepreneurs in Angola’s capital Luanda are hitting the road, travelling by plane to Brazil, among other fashion hubs, to buy up coveted Brazilian styles. They return with suitcases full of clothing, Havaianas flip-flops and accessories to sell to eager consumers in Luanda’s informal markets . This woman-led, pop culture-driven South-South fashion trade, which has been largely overlooked in research on African gender mobility, results from Angola’s struggling post-war economy. Since the end of the 26-year Angolan civil war in 2002, the country has had high unemployment and an undiversified market , compelling entrepreneurs to look abroad for opportunity. 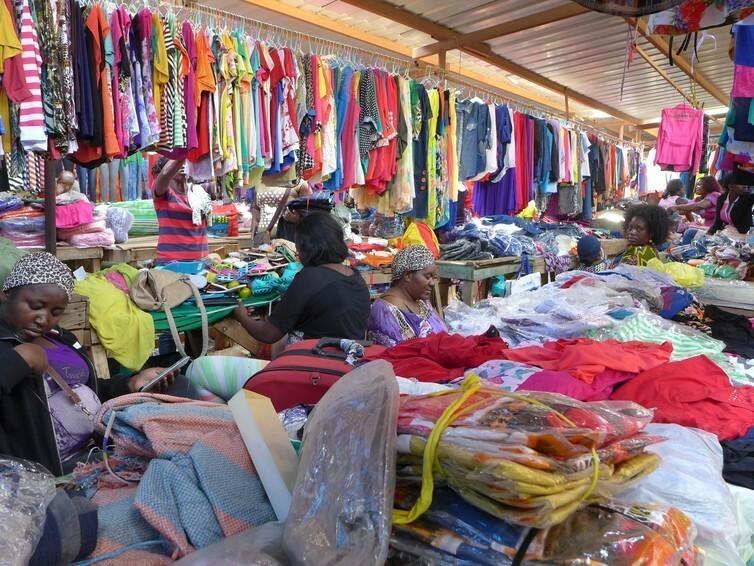 The textile trade’s “suitcase traders”, or moambeiras, as the female importers are often called, are mainly mothers and heads of households aged 30 to 50, who live in Luanda’s poor periphery. Independently but as part of a network, they organise regular buying trips on one of four weekly flights between Luanda and São Paulo, Brazil, a global fashion centre . Though there is no official data on the subject, the number of Angolan women travelling to Brazil is estimated at around 400 per week. To reduce costs and to make them feel less isolated on business trips, which may last a few days or a week, the moambeiras stay in hostels in São Paulo that specialise in housing African traders. In Brazilian markets, though, the Angolan women will mix with other buyers and retailers from across the world. Each year 11 million people come to São Paulo from Latin America, Africa, Asia, and Europe to shop. Because of its low production costs and large night markets, São Paulo is also an important place for informal or illegal commerce. For the moambeiras, there is no better place to shop than the Feira da Madrugada, located in the megacity’s Brás district, which has thriving African networks. Restaurants and hostels that specialise in African clientele offer places to socialise, make connections and, for many, spaces where black Africans in Brazil, a multi-ethnic society with prevalent racial discrimination , can feel comfortable. “Here it’s ours,” claimed one moambeira during my doctoral research in Brazil in 2013, referring to São Paulo’s African enclaves. Brazil has long held an ambiguous power of attraction in Africa, especially for Portuguese-speaking countries , such as Angola and Mozambique. The country has high crime and violence rates that may strike fear into the hearts of travellers, but the Brazilian TV series so popular at home also show the country as a land of hope and opportunity. In 2011, about 15,000 Africans from 55 different countries were officially registered in Brazil, and sources report the number of Angolan residents of Brazil at around 1,100 . Some of them are refugees, though exact numbers are unknown. For Portuguese speakers, Brazil also offers unparalleled opportunity for economic and educational advancement . Because fashion is by its nature an aspirational industry and telenovelas have a demonstrated impact on women’s behaviour and world views , for Angolese female consumers, wearing Brazilian clothes may represent something more than just good style. It may feel like an act of empowerment. Joana, a 36-year-old Angolan, travels to Brazil once a month to buy clothes and Havaianas. She explained to me how she selects clothing according to the characters played by Brazilian actresses. This ease of access motivates female traders to continue travelling to Brazil despite the cost of plane tickets and high Angolan customs taxes that take a bite out of their bottom line. But trade destinations are shifting quickly. Today, Brazil is in the midst of a severe economic crisis . Austerity and political collapse are hurting its image as a land of opportunity for African migrants and entrepreneurs. Meanwhile, China’s fortunes are on the rise, as is its investment in Africa . For Angolan textile traders, as for other segments of the global clothing trade, it is quickly becoming one of Brazil’s main competitors. In 2013, Joana mentioned to me that she was considering going to China to pursue business, but was concerned about her ability to navigate there considering that she lacked a local network. By 2014, when I met her back in Luanda, that hurdle had evidently been cleared. Joana showed me the Chinese clothing she was already selling. As the Chinese market swiftly adapts to offer clothing in colours and styles that appeal to African tastes, its competitive edge over Brazil is sharpening for Angola’s moambeiras. Linguistic and cultural challenges aside, Chinese businesses have demonstrated a willingness to engage in trade with Africans , and the low price of Chinese goods helps to offset the higher cost of airline tickets. This informal garment trade is one small part of the growing commercial relationship between China and Angola . Still, not all female entrepreneurs can pull off such a trip, especially given Angola’s current economic crisis . In the long run, whether the entrepreneurial moambeiras of Luanda set their sights on China or keep business focused on Brazil, these women will continue to reveal the global origins of Angola’s informal trade – and its fashion style.